Victims were lured into the open before they were shot. TWO GUNMEN WORKING as a team fatally shot five people and critically wounded two others at a backyard cookout in Pennsylvania yesterday. One attacker used a high-velocity rifle to shoot all the victims in the head as they were driven in his direction, a prosecutor said Thursday. “The murders were planned. They were calculated, brutal,” District Attorney Stephen Zappala said of the Wednesday nighttime shootings. The gunmen appeared to have targeted one or two of the victims, said Zappala, who added that they hadn’t ruled out drugs as a motive. 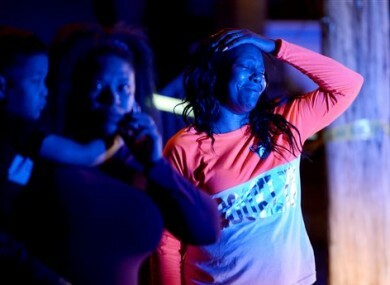 Four women, one of them pregnant, and a man were killed as they rushed toward the back porch and an alleyway to seek cover as a gunman fired a .40-caliber pistol at as many as 15 adults who were playing cards and having a late-night cookout in the yard. That steered the victims toward the rear porch and door of the house, where an accomplice armed with a 7.62 mm rifle similar to an AK-47 shot them from behind a chain-link fence less than 10 feet from the porch, Zappala said. Neither weapon has been found. The man with the rifle aimed high throughout the barrage of bullets. Four of the dead were found on the tiny back porch. “They were all head shots,” Zappala said. The dead included three siblings, Brittany Powell, 27, who lived at the home; Jerry Shelton, 35; and Chanetta Powell, 25. The other two were Shada Mahone, 26, and Tina Shelton, 37. Zappala said Brittany Powell was pregnant and due to give birth in May. “It looks like right now they were all fleeing toward the back door of the residence when the second gunman fired from the side of the yard,” said Lt. Andrew Schurman of the Allegheny County homicide unit. They all seemed to get caught on the back porch. Carl Morris and his son, Robert, were getting ready to leave their house across the street when they heard a volley of three shots, a pause, then gunfire lasting more than a minute. “It was terrible,” the younger Morris said. The Morrises said Brittany Powell lived at the home with a daughter who was about 6 or 7. They said the house was considered a “safe haven” in the neighborhood. The backyard is about 30 feet by 50 feet. Police said they found one pile of shell casings just outside the yard in an alley, where they believe the .40-caliber pistol was fired, Zappala said. They found more shells along a fence that separates the house from a neighbor’s yard, which is where Zappala said the rifle was fired. Email “Two gunmen lured five victims from a barbeque before shooting them with an AK-47 ”. Feedback on “Two gunmen lured five victims from a barbeque before shooting them with an AK-47 ”.